Develop conflict communication skills and the climate of the school community. Focus upon teachers and parents as well as students depending upon your goals. Define and reinforce a consistent school-wide policy on conflict resolution and bullying prevention. Include text books and recordings by Sarah Pirtle to provide continuing resources for the school. Include a school-wide event involving language arts, creative dramatics and music to build awareness and provide a focus. What's the Next Step for Your School? Responding effectively to bullying involves a coordinated community with clear adult intervention plans, dialogue and training for the whole school community, as well as ongoing activities that build a climate of mutual respect. Sarah Pirtle offers a free 30 minute phone consultation to discuss the needs of your PreK-6th school. She will help you identify your choices and select steps that will be meaningful to support your unique school culture and community. Click here to read REFLECTION QUESTIONS for schools in the process of changing bullying. Email Sarah at pirtle22@hotmail.com or phone (413) 625-2355. 1. If you choose to contract with Sarah Pirtle, she will create an individualized program responding to your needs and choices. Phone consultation will continue to help you identify where to put your focus and which specific social messages, plans, and social skills you will emphasize. Tricia S. Jones and Randy Compton, Editors. 2. Efforts will be made to set fees that are affordable for your school. 3. An individualized schedule will be set up that can include teachers, staff, parents, and students as requested. Sample schedules from past residencies at other schools can be sent as models upon request. Your plan can include trainings, consultation, classroom workshops, school assemblies for all classes, smaller assemblies for combined classes, and/or an evening program for parents involving students who are able to attend. Sarah brings thirty years of experience in the field and can help you design a plan that addresses your goals. 4. When a school comes on board, selected textbooks and recordings that support the goals are sent in advance as part of the residency. You have permission to copy recordings and share them with teachers to help select which lesson plans best match their needs. 5. It is important to identify a team of two people who will make sure that the residency is effective and will communicate with your school community about your goals. These might include the principal, other administrators, guidance counselors, teachers, or a parent to share this role. Two people working together make sure that there is clear communication with each part of the building as well as with Sarah. They are also responsible for helping what is accomplished during the residency continue in the months that follow. The goal is to provide a program that will have long-lasting value. to create classroom workshops that demonstrate skills chosen by the staff. You will be sent a short feedback form so that participating teachers can indicate their needs and preferences. I shared a book called We Shall Overcome by Stuart Stotts while leading programs at Queensbury Middle School in NY State. 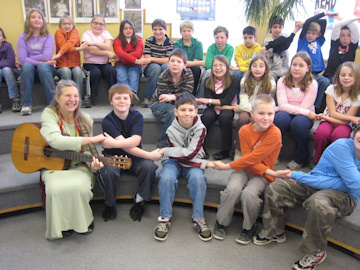 When students saw the hand-shake that is used traditionally in the singing of this song, it was their suggestion to join hands, and a camera caught the moment. Here you can find general ideas to help with constructive conversations in daily life. Extensive lesson plans are available in the text books: Discovery Time and Linking Up. What does a Talk-it-Out look like? 1. What does a Talk-it-Out look like? Guiding Children: Help them meet together face to face. For Families: Join hands and sit on the floor together. For Adults: Prepare yourself by beginning with your intention. Are you concerned that you need to defend yourself to be understood? Can you move into an intention to learn and grow? Take turns talking and listening. Guiding Children: After each person has spoken, look for a way to articulate the strands of the problem and put attention there. For Families: Parents summarize – "Is this what the problem is____?" to help children feel understood. For Adults: Expand perspective to include both people's viewpoints. Verbalize what the crux of the matter is. "I guess what we're trying to figure out is ________." Guiding children: Help them generate their own plans for solving the problem. For adults: What matters most to me is ________. I'd be willing to _________. Select an action that will help the problem. If the focus is on increased understanding more than a particular concrete action, you can summarize it: "Next time, I will/won't___." Guiding children: Help them clarify what they're going to do as a result of this talk-it-out. Test out that the plan is realistic by asking, "How would this work?" For adults: Start to move together toward actualizing the solution that you've agreed upon. Choose closure that you like – a nod, a smile, a hug, a "hooray!" 2. What's a Talk-it-Out sandwich? I was teaching the children at Tree of Life School how to find a solution that takes into account each person's needs. In the field of conflict resolution, this is called a win-win solution. However, I wanted a term that would be more descriptive for their age group. "See! We're building a sandwich!" I said with excitement. As another student raised their hand to add their thoughts, I said, "Watch! We can include their ideas and make the sandwich bigger." As each need was spoken, we worked together to incorporate it like building ingredients. Now when we reach solutions, the children call it, "Making a sandwich." In fact, the way they like to give closure to the talk-it-out is they say – I want to eat the sandwich. As the solution is summarized, they pretend they are holding a sandwich and begin to munch with much laughter. Music: "Two in the Bed and the Little One Said Roll-over." New words by Sarah and 2nd grade students from Central Elementary School in Bellows Falls, Vermont. How to find it: The Linking Up! book and recording. Activity: Use your fingers to beckon and turn it into a fingerplay. There were two in the fight and the little one said, "I'm angry, I'm angry." But the other one started to run away. Come back and hear what I have to say. "Come on back, come on back. We can figure this out. Come on back, come on back. We can figure this out." There were two in the fight and the other one said, "I'm angry, I'm angry." But the little one did not run away. "Tell me what you have to say." Talk it out. Talk it out. We can figure this out." True Story: "I didn't believe you, Sarah, when you said children are highly receptive to the idea of talking it out. After you showed your song Two in the Fight at the New England AEYC workshop, I said – Oh, well. I guess I'll try it once. I led this song one time with my pre-school. An hour later during morning playtime I saw two girls in an argument. One of them did the finger motions of the song to signal her friend that she wanted to talk it out. Sure enough that signal calmed everything down. And they did talk it out. Thanks." Use the lyrics of the song, "Talk It Out," to discuss conflict transformation. I wanted to create a realistic song that looked at the difficulties of talking things out and painted a picture of the effort involved in a communication breakthrough. 1. As an icebreaker, ask the students "Have you had a conflict that gnaws at you but you're afraid to actually sit down and deal with it?" Discuss, "What are some reasons why a person would like never to talk out a conflict?" In response to these questions students often express fears that someone will make fun of them or that the problem will get worse. The song says, "Talk It Out, I don't want to do it." 2. Play the recording. Ask why they think I made the melody of the song so fast and selected the instruments that I did. Then explain that I wanted the music to show the anxiety people feel when they are dealing with conflicts as well as convey the excitement for the potential of transforming them. I felt the accordion, drums and electric guitar would convey the fast heartbeat we get when we're upset. I also wanted to indicate the joy and relief of pushing through fear to talk out the problem. 3. Place students in two lines facing each other in partners. Each line has a chance to portray one of the characters—either the person who is asking to talk it out, or the person who initially walks away. Step one: Pairs face each other at a distance with angry expressions. I'm so angry I can't see straight. I'm mad as a bull breaking down a gate. You and I are in this fight. Gotta find a way to set things right. Talk it out. We don't wanna do it. Talk it out. Do we have to go through it? Talk it out. There is no doubt. Gotta jump back, come back, talk it out. Step two: One person walks toward the other. Both act out words. I walked up to talk to you. But you turned your head. What can I do? I try to talk, but you go away. Gotta jump back, hear me out today. Talk it out. You don't want to do it. Talk it out. We have to go through it. Step 3: Act out this change. I didn't give up. I said, "Come on." This fight's going on too long." "I know," you said, and you nearly cried. Jump back, come back, we both tried. Conclusion: Show that they are friends again at the end. Talk it out. Talk to me. Talk it out. Now I see. Talk it out. We can mend. Jump back, come back, friends again. Before Journey Camp begins, parents are asked to go over the following seven scenarios which flesh out how communication works at camp and what the basic agreements look like in action. Although these scenarios describe a camp setting, the basic agreements are widely applicable. You and two friends have been eating lunch together the whole week. You don’t want to eat a part of your lunch. You put it down on the grass. One friend picks it up and throws it at the other. A food fight starts between them. A staff person comes over and asks all three of you to participate in a “talk it out” time. You didn’t throw any food. What would you do? WHAT WE HOPE YOU WILL DO: Be part of the discussion and join the circle to talk about this. REASON: We encourage productive “talk it out” times that feel safe for all participants. We will assemble all people who can shed light on a problem so that we grow in understanding. You may have an important role as witness. Talk it out times aren’t a time for blaming, but rather for growth. It helps complete the understanding of the problem to include relevant people nearby. Each person talking will be listened to. You ask someone to build a stick house with you but they have already planned to build with someone else. You’ve tried to talk to them but things seem to be getting worse. What would you do? WHAT WE HOPE YOU WILL DO: Ask for help from an adult or a Counselor. When the staff isn't looking, a camper who is feeling uncomfortable is sticking out her tongue at you and flashing angry looks. You want this to stop. What would you do? WHAT WE HOPE YOU'LL DO: Figure out the best way to get help with this. Decide if you want to try asking them to stop first, or go right to a staff member and describe what is happening so that they can assist. If you prefer, tell a parent and they'll let us know. REASON: Whenever something upsetting is happening, adults can help. If you can handle it alone, use the Stop Rule, but make sure you use a friendly way of talking so it doesn't get worse. What words could you use to get your message across? Everyone has signed the agreement to use the Stop Rule. This means that if anyone asks you to stop a behavior – like teasing, grabbing, chasing, or hitting – that you will stop immediately. Adults can't always notice teasing and other upsetting things that are going on, but we want to hear about them so we can help keep things friendly for everyone. Let’s imagine that you have a friend from school that you sometimes play fight with. During lunch on the grass, suddenly you tackle that friend and roll around with them. You are both having a good time. A Counselor in Training is watching you with concern. The staff person says, “Stop.” What would you do? WHAT WE HOPE YOU WILL DO: Stop. REASON: Everyone has to be able to control themselves upon request. If you are having trouble stopping, your parents and the staff will work together to teach you the importance of stopping when asked. Play fighting can turn into hurt and can be confusing for others to watch. We’ll help you start a different game. A person you want to play with is upset with you and walks away. She or he returns with a counselor and asks you to talk it out. During the talk it out, each of you is asked to explain what it was that they found upsetting and what you think will help. You hear that the other person felt you were yelling. WHAT WE HOPE YOU WILL DO: Listen to their feedback and try a different way of talking. REASON: Each person needs to be able to set agreements for what feels friendly and unfriendly. We have a rule in the Camper Code to treat everyone in a friendly way. Sometimes it's hard to know what that looks like. The staff will help children negotiate friendships and help you talk about whether you'll play together or separately. We do a lot of work the first days in making sure people feel included as they decide where to build their stick house. Let's imagine that you and a new friend are working on a stick house. Later another person asks to work with you. It's a small area and you would prefer working as a pair. WHAT WE HOPE YOU WILL DO: Tell them your preference. If you want to, ask a staff person to help with the conversation. You might offer that they could build near you or just enjoy visiting your house. REASON: We encourage people to express their real needs without using put-downs. We've been working up in the woods on our stick houses. It's nearing lunch time. Most of the group is hungry and goes back down with five staff members. Two staff members stay up in the woods with a dozen others for a longer period. Now it's time for everyone to go back down. You don't want to go back down. WHAT WE HOPE YOU WILL DO: Listen to the reason that one staff person can't stay up with one child, and go back down with the whole group even though you'd rather keep working on your house instead of eating lunch. REASON: At camp we look at how the whole group is affected. It's important for campers to respond to the requests of a staff person and to learn how to incorporate the needs of others. We will help campers see things from the point of view of the broader community and learn about the skill of compromise.